Make this beautiful collage using leaf stamps and leaf templates! Explore with lots of color and creativity and let students make chances with their art. The outcome is both abstract but functional: process and result-based art! Set a sheet of fingerpaint-safe paper onto the R7512 Fingerpaint “No Mess” Tray™ and provide your students with the bowls and bottles of paint needed to make their stamping project. Squeeze a few drops of each color of paint into one paper plate. When children go to use their stamps they will get a variety of different colors on one stamp. Remove several different leaves from 1-2 sheets of the R15334 Crafty Leaves pack. Place the leaves at random intervals throughout the sheet of paper. Tip: You may tape the leaves onto the canvas to keep them in place. The Crafty Leaves will be used as stencils in reverse. 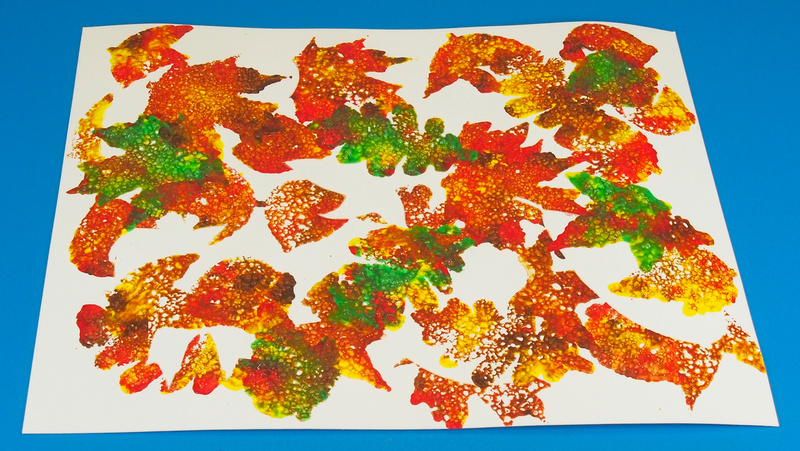 While the children stamp around and on top of the leaves, the Crafty Leaves will leave behind a white negative space in the shape of a leaf where they were placed. 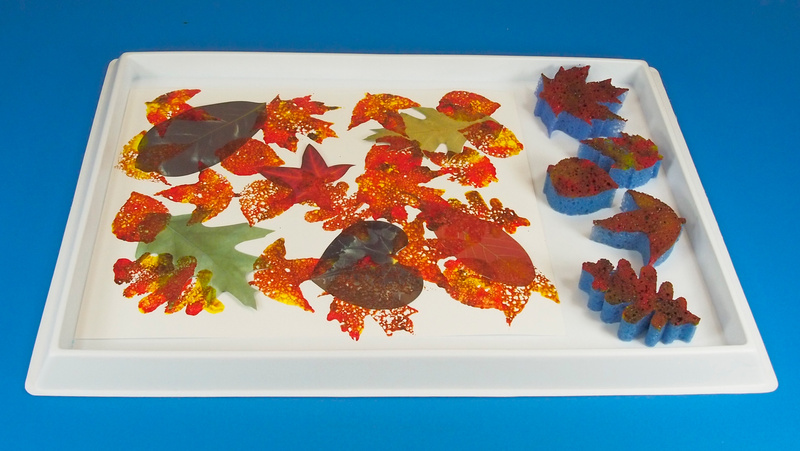 Next, dip the leaves sponges into the paper plate and start stamping on top of the Crafty Leaves. Fill up a lot of the white space in the canvas–as much as you can! Next, gently remove the Crafty Leaves from the canvas to reveal the white spaces underneath. You will need another paper plate to complete the next step. Re-apply the paint drops to the paper plate but this time, add in a sharply contrasting color from the autumn-themed colors such as blue or green. I’ve chosen a green color below. Dip the leaves sponges into the new paint color and stamp throughout the canvas. 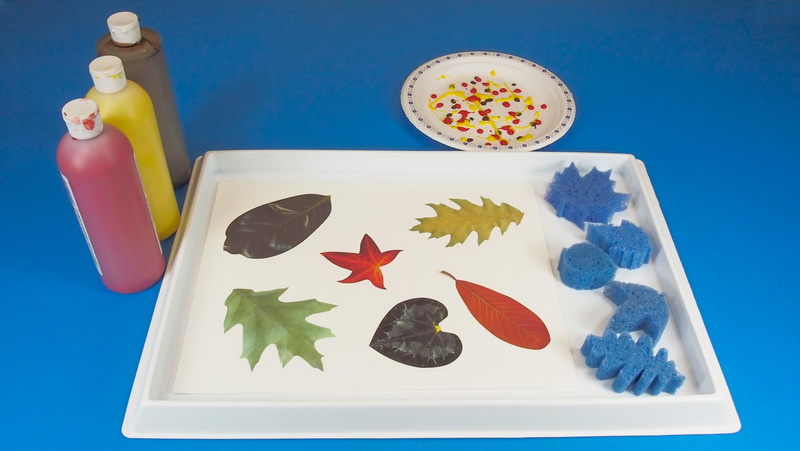 Students will love being able to stamp different kinds of colors onto their artwork and will, in addition, enjoy turning the stamps at different angles to simulate the appearance of randomly-falling leaves in their artwork. This entry was posted in Art and tagged art, autumn, leaves, nature, paint, stamping by roylcoblog. Bookmark the permalink.